G Suite makes it easier for users to collaborate efficiently and effectively. An important part of collaboration is deciding how and when to follow up with others. 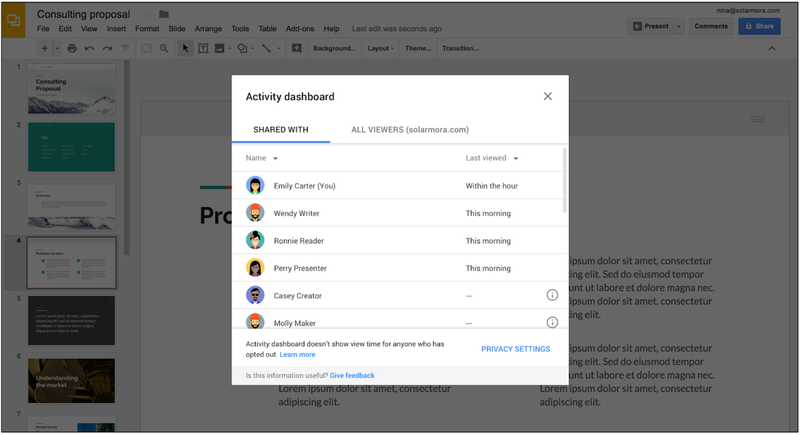 To help inform these decisions, we're introducing Activity dashboard in Google Docs, Sheets, and Slides. It’s a feature that lets users with edit access see who has viewed the file and when they viewed it. For example, a user can check if a coworker has seen a file already and alert them that it’s been updated. Or an account manager can judge the best way to follow up with a partner, depending on whether that partner has viewed the materials they previously sent. As of March 7th, G Suite administrators have access to new Admin console settings to control the Activity dashboard feature for their domain or the organizational units (OUs) within it. On March 21st, end users will begin to see Activity dashboard in Docs, Sheets, and Slides. See the “Release schedule” section below for more information. As an admin, you can determine whether viewing data from your organization’s users is shown in Activity dashboard. Specifically, you can choose to make viewing data for your organization’s users visible, not visible, or only visible within your organization. See the “Review and change your organization’s Activity dashboard settings” section below for more information. If you make viewing data visible for your organization, your users can still choose to exclude their individual viewing data from showing in Activity dashboard via their personal privacy settings. If an admin makes their organization’s viewing data not visible, your end users won’t be able to choose to share their viewing data. See the “End user controls for Activity dashboard” section below for more info. Users with edit access to a file and who belong to the same domain as the file’s owner will be able to see that file’s Activity dashboard and any viewing data which is available in it. On: Activity dashboards show all user views, unless individual users hide their information. On - Only within your domain: Your users’ viewing information is only visible in Activity dashboards of files owned by users in your domain and to other users within your domain, unless individual users hide their information. Your users’ viewing data will not be visible in Activity dashboards of files owned by users in other domains. Off: Your users’ viewing data will not show up in Activity dashboard for any file. Your users may be able to see whether external users have viewed their files, depending on the Activity dashboard settings of those external users. Find out how to change the setting for your organization in our Activity dashboard Help Center article for admins. Note: Activity dashboard and its settings don’t affect the data collected in your G Suite Drive audit log. When Activity dashboard becomes available to your users, they’ll see a notification in Google Docs, Sheets, and Slides that explains the feature and their control options. Activity dashboard will only show viewing data for a user after they see this notification. It will not display any activity from before they saw it. All users will have access to privacy settings that allow them to control whether their views show up in Activity dashboard at any time. For more information and to change settings, users can see the Activity dashboard Help Center article for users. If your domain is on the Rapid Release track, Activity dashboard will not be available to end users before March 21st. Due to a gradual rollout, all Rapid Release domains may not have access to the feature for up to two weeks after that. If your domain is on the Scheduled Release track, Activity dashboard will not be available to end users before April 9th. Due to a gradual rollout, all domains may not have access to the feature for up to two weeks after that. Learn more about this feature in our Help Center article on how your users can use and control Activity dashboard, as well as our Activity dashboard Help Center article for G Suite admins. Over time we’ll add features to Activity dashboard to provide more insights into activity on the file and to make it easier to communicate with collaborators directly from Activity dashboard. User-facing feature will begin to roll out to Rapid Release domains in two weeks and to Scheduled Release domains in five weeks. Activity dashboard access: Available to G Suite Business, Enterprise, Education, and Nonprofit editions only. Users will be able to see the Activity dashboard for a file if they have edit access to that file. 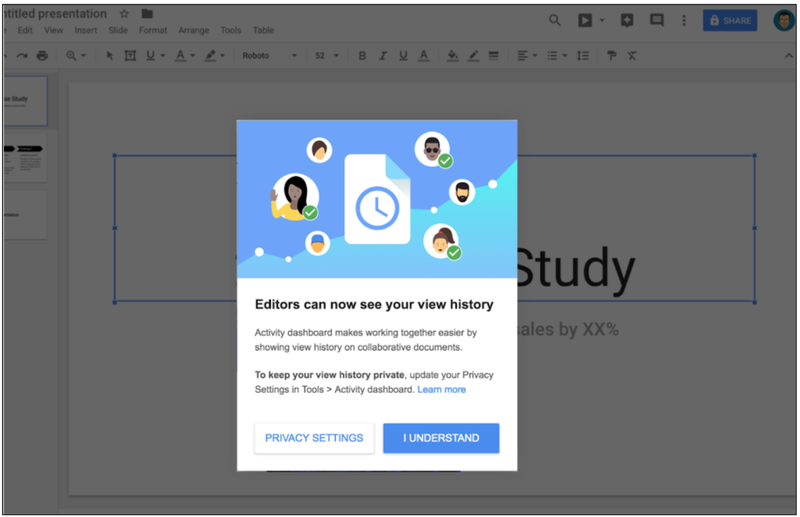 Activity dashboard viewing data visibility settings: All users have access to privacy settings for Activity dashboard, as data from users in all G Suite editions can appear in the dashboard.